Enrico Fermi, an Italian physicist, is well-known for his achievements in both theoretical and experimental physics. This is an exceptional achievement in a period where scientific accomplishments have focused on one aspect or the other. He is mainly remembered for his work on the advancement of the first nuclear reactor, and for his contributions to the development of quantum theory, nuclear and particle physics, and statistical mechanics. Enrico Fermi was born in Rome, Italy on 29th September, 1901. His father, Alberto Fermi was a Chief Inspector of the Ministry of Communications, and his mother, Ida de Gattis was a school teacher. He received his early education from a local grammar school and at a young age developed a great interest in physics and mathematics. Fermi’s aptitude for physics and mathematics was encouraged by Adolfo Amidei, one of his father’s friends, who gave him several books on physics and mathematics, which he read and understood quickly. In 1918, Fermi joined the Scuola Normale Superiore in Pisa. Here he spent four years there and gained a doctor’s degree in physics in 1922, supervised by professor Puccianti. A year later he was awarded a scholarship from the Italian Government and spent few months with renowned physicist Max Born in Göttingen. With a Rockefeller Fellowship, in 1924, he moved to Leiden in the Netherlands to work with theoretical physicist Paul Ehrenfest. That same year he returned to Italy where he was appointed for two years as a lecturer in mathematical physics and mechanics at the University of Florence. From 1927 to 1938, Fermi served as the professor of theoretical physics at the University of Rome. Fermi married Laura Capon in Rome in 1928 and they had a son, Guilio and a daughter, Nella. During 1939, he was employed as the professor of physics at Columbia University, New York until 1942. Fermi became an American citizen in 1944 and in 1946 he accepted a professorship at the Institute for Nuclear Studies at the University of Chicago, a position which he held till his death. During his time in Paris, Fermi and his team made major contributions to many practical and theoretical aspects of physics. In 1934, while at the University of Rome, Fermi carried out experiments where he bombarded a variety of elements with neutrons and discovered that slow moving neutrons were particularly effective in producing radioactive atoms. His experiments led to the discovery of nuclear fission and the creation of elements beyond uranium. In 1938, Fermi won the Nobel Prize for Physics for his work on nuclear processes. In 1935, Fermi discovered the quantum mechanics statistical laws, nowadays known as the Fermi statistics,giving a statistical model of the atom and nucleus. Fermi continued to conduct nuclear fission experiments at Columbia University. In 1940, Fermi and his team proved that absorption of a neutron by a uranium nucleus can cause the nucleus to split into two nearly equal parts, releasing numerous neutrons and huge amounts of energy. This was the first nuclear chain reaction. During the Second World War, Fermi was a key member of the Manhattan Project, working at the Los Alamos project in New Mexico on developing an atomic bomb. On July 16, 1945, the first atomic bomb was detonated at Alamogordo Air Base. In his later years, Fermi became interested in the origin of cosmic rays and investigated subatomic particles, especially pi mesons and muons. 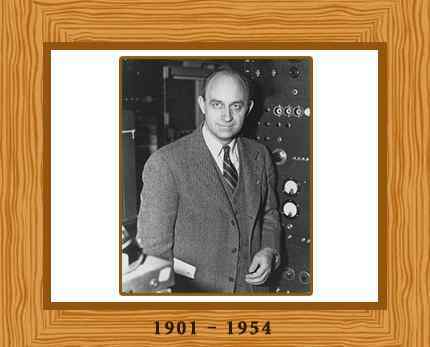 Fermi’s historic accomplishments caused him to be recognized as one of the great scientists of the 20th century. He died of stomach cancer on 28 November 1954, aged 53 and was buried in Oak Woods Cemetery in Chicago.